The 2013 Bordeaux harvest is drawing to a close as the last of the Cabernets and final Sémillon selections for sweet whites are picked. Sighs of relief all round. Few grapes are left on the vine now, although they only finished the Merlot at Chateau Fleur Cardinale in Saint-Emilion on Saturday. They hadn’t even started the Cabernet Franc (right). ’C’est pas mûr (ripe)’ said the cellar master as he gestured towards the unpicked vines; the bunches were admirably free of rot, thanks to the colder, later-ripening terroir. I’ve tasted a lot of red grapes in the last few weeks around Bordeaux and he just about summed it up. Most reds have had to come in before they were ripe. This should have been a late October harvest, by rights, given the extremely late flowering in June and retarded colour change that dragged on into early September. (In between, we had a hot July and a pretty good August – but don’t mention the hail). If there are any successes, and there will be some, they are triumphs over adversity. This has been the most difficult growing season for red Bordeaux that I’ve seen in fifteen harvests, capped by nerve-jangling conditions for the picking. The threat of rot at harvest time is also the most acute I’ve witnessed. Many chateaux have picked healthy-looking grapes in the nick of time, or sorted them as best they could. Seeing so many botrytis-affected bunches discarded beneath the vines has been a sad but necessary image. It’s not that the 2013 harvest has been blighted by days on end of incessant rain. What we’ve had is a series of two-day stints of rain, starting with the last weekend of September (27-29), then 3-4 October (we had 75mm in two days here, 20 kms south east of Bordeaux) and more downpours over the weekend of 12 October. In between we’ve seen the windows for harvesting and, simultaneously, dangerous periods of warmth and humidity which are ideal for the spread of botrytis. (Even now, in the third week of October, it’s a clammy 19°C this morning.) The picking schedules have largely been determined by the staying power of the grapes in any given parcel. Some of the larger estates of Pauillac, St-Julien and St-Estèphe can point to their more resistant Cabernet Sauvignon on the gravel mounds near the Gironde. 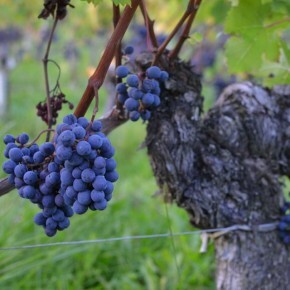 Healthy-looking Cabernets were being brought in just before, during and after the weekend of 12 October at vineyards like Lynch-Bages and Montrose, for example, but this is by no means late for Cabernet Sauvignon. I’ve mentioned before that yields are generally low and extremely variable. While the bigger production estates like these might have reasonable but lower than normal yields (judging by the grapes, of around 35-38 hl/ha), I understand two important Pauillac estates are down at a tiny 15hl/ha. Compare that to the legal ceiling of 57 hl/ha in 2013. In the generic Bordeaux appellations, yields are even lower than the recent official forecast, I reckon. Rendements of around 25hl/ha for red are commonplace. The whites, both dry and sweet, have been more fortunate. The dry whites were largely in before the damp and sweaty weather of the last weekend of September, while growers in Sauternes and other sweet white appellations have enjoyed having botrytis on their boots. 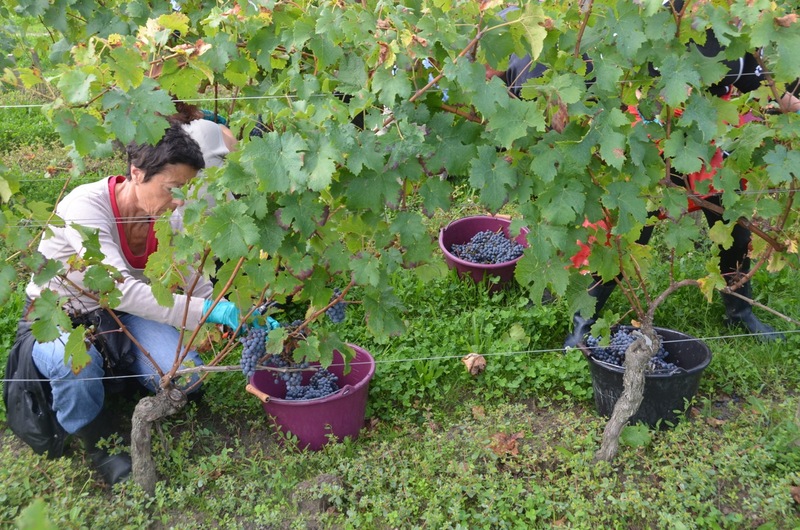 The initial selections by the pickers (they pass down each row several times, snipping off only the berries that have been shrivelled by noble rot) were very promising. The middle section was less thrilling after rain diluted some batches but the final tries this week should produce terrific, mouldy grapes and good quality juice. The signs are very positive. 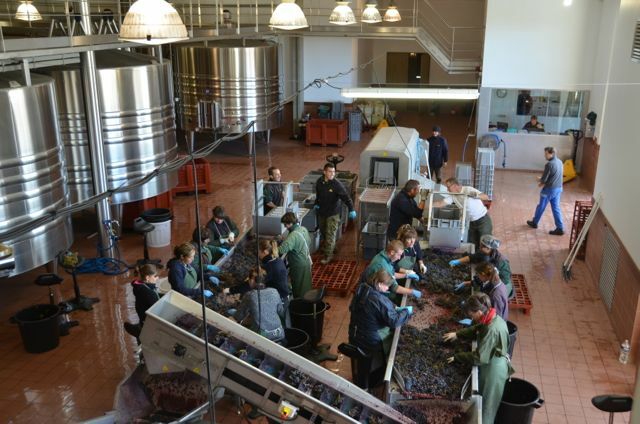 For the reds, let’s not be too hasty to pre-judge the wines, as there’s an awful lot of work to be done in the cellars before we get to the assemblages for the en primeur tastings next Spring. I’ll cover the challenges regarding the wine-making at a later stage. It’s fair to envisage, however, that with lower yields and stricter-than-ever selections for the Grands Vins (the first or ‘Chateau’ wines) there won’t be a lot of great wines on the market next May and June. Still, there’s always the World Cup in Brazil to look forward to. Roll on 2014.